In this report, the global market is broadly segmented by product, application, end user, and region. The global market is segmented on the basis of products, applications, end users, and regions. By type of product, the market is categorized into media bags and containers, filtration assemblies, single-use bioreactors, disposable mixers, and others (tubing, connectors, and samplers). The media bags and containers segment is expected to account for the largest share of the single-use bioprocessing products market in 2016. This large share can be attributed to the increasing adoption of media bags and containers in transportation and storage application. Based on application, the market is segmented into filtration, storage, cell culture, mixing, and purification. The filtration application segment is expected to account for the largest share of the single-use bioprocessing application market in 2016. This large share can be attributed to the increasing adoption of single-use tangential flow filters, depth filters, and chromatography columns in the process development. On the basis of end users, the market is classified into life science R&D and biopharmaceutical manufacturers. Biopharmaceutical manufacturers are the major end user of the market in 2016. Growth of this market is propelled by the increasing demand for biopharmaceuticals, high energy efficiency, low water usage, less floor space requirement, very low risk of product cross contamination, and faster to implement are the key drivers for the growth of the global single use bioprocessing market. Emerging markets such as Brazil, China, and India provide new growth opportunities to players in the single-use bioprocessing market. On the other hand, extractability and leachability issues regarding disposable components like plastic bags, and environmental and economic concerns are the major factors that are restraining the growth of the single use bioprocessing market. In addition, the waste disposal of single-use processes and scaling-up issues are key market challenges. 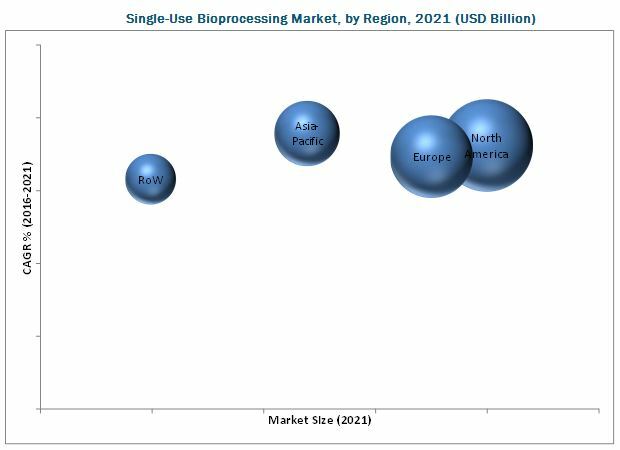 The single-use bioprocessing market is dominated by established players such as Thermo Fisher Scienctific (U.S.), Danaher Corporation (U.S.), GE Healthcare (U.S.), Sartorius Stedim Biotech S.A. (France), and Merck Milipore (Germany). This research report categorizes the single-use bioprocessing market on the basis of products, applications, end users, and regions. The global single-use bioprocessing market is poised to reach USD 5.44 Billion by 2021 from USD 2.47 Billion in 2016, at a CAGR of 17.8% from 2016 to 2021. In this report, the global market is broadly segmented by product, application, end user, and region. Major factors fueling market growth are the increasing demand for biopharmaceuticals, high energy efficiency, low water usage, less floor space requirement, very low risk of product cross contamination, and faster to implement are the key drivers for the growth of the global single use bioprocessing market. On the other hand, extractability and leachability issues regarding disposable components like plastic bags, and environmental and economic concerns are the major factors that are restraining the growth of the single use bioprocessing market. By type of product, the market is categorized into media bags and containers, filtration assemblies, single-use bioreactors, disposable mixers, and others (tubing, connectors, and samplers). The media bags and containers segment is expected to account for the largest share of the single-use bioprocessing products market in 2016. This large share can be attributed to the increasing adoption of media bags and containers in transportation and storage application. Furthermore, on the basis of application the market is segmented into filtration, storage, cell culture, mixing, and purification. The filtration application segment is expected to account for the largest share of the single-use bioprocessing application market in 2016. This large share can be attributed to the increasing adoption of single-use tangential flow filters, depth filters, and chromatography columns in the process development. North America is established markets for single-use systems. Increasing demand for the biopharmaceuticals especially from in the aging population, increase growth in R&D investments by biopharmaceutical companies, and patent expiries of biologics are the key drivers for the North American single-use bioprocessing market. Compared to mature markets, the Asia-Pacific region is expected to grow at the highest rate from 2016 to 2021. Growth in this region is propelled by factors such as improving R&D infrastructure, rising focus of market players, and increasing government initiatives. The market is dominated by established players such as Thermo Fisher Scienctific (U.S.), Danaher Corporation (U.S.), GE Healthcare (U.S.), Sartorius Stedim Biotech S.A. (France), and Merck Milipore (Germany). 11.4 Sartorius Stedim Biotech S.A.
11.11 Cesco Bioengineering C0. Ltd.